UK has something in store for the Apple fan boys. 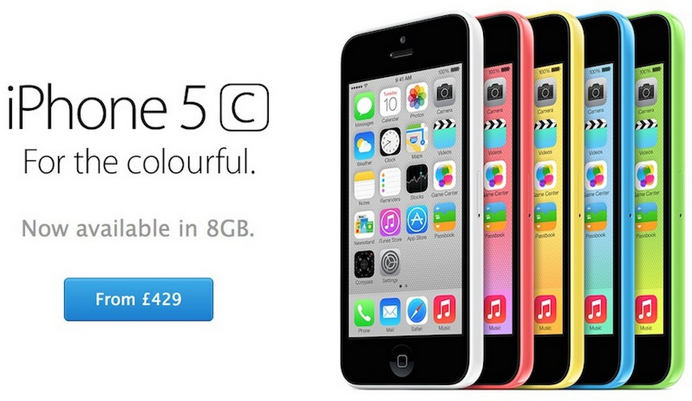 The rumor turned good news is that UK is enjoying sale on 8 GB iPhone 5C variant that allows you bag the gadgets for a ‘cheaper’ price. This was reported by Engadget that UK Apple Store quoted price less than other countries. The UK Apple Store has it priced at £429 ($714) which means it is £40 cheaper than the 16 GB version, and the German Apple store has price higher at €549 ($764). Not only the desirable price tags offered by Apple but also the UK operator O2, French provider SFR are offering the phone for free and one euro respectively on multi-year contracts. But on the other hand German carrier O2 is also having great offers but either you’ll have to pay €149 or €29 upfront. Then you can select anyone of the three multi-year plans. The detailed plans offered by the operators of Germany are received from a German blog but we are not sure if the 8 GB iPhone 5C will eventually make it in other parts of the world outside Europe. But that’s a matter of time to get to know what’s awaiting the future.